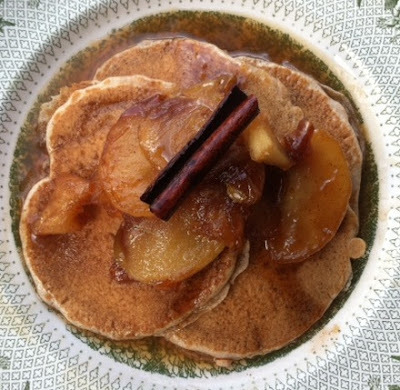 Apple Pancakes and Apple Cider Syrup and Apple Chunks... Oh my! I'm on a bit of an apple kick right now. You may have noticed. I can't eat raw apples (or bananas)- something about the rawness I'm allergic to. So now that I've discovered a bunch of fun ways to eat them in baked goods, I'm all over it! Chris and I decided to make breakfast for my parents yesterday morning. After some serious arm-twisting (hah), they gave up their Nutrisystem for the moment. The verdict: totally worth it! Chris put the plate together- A+ for presentation! 1. Mix flour, sugar, baking powder, baking soda, salt, and spices until thoroughly combined. 2. In a separate bowl, gently whisk eggs, then add buttermilk, regular milk, and butter. Mix until just combined, do not overmix! 3. Add wet ingredients to dry, then add apple chunks. The batter will be a little chunky, and that's okay! Let batter sit undisturbed for 10 minutes. Then heat up a griddle and have at it! If you don't know how to make pancakes... Click on the "Katie at the Kitchen Door" link. 2. When butter stops foaming, add apple cider, brown sugar, and cinnamon sticks. 3. Bring mix to a boil, and continue cooking over medium heat, stirring frequently, until reduced by half to about 1 to 1 1/4 c; this will take about 15 minutes. Note: The apple chunks are Chris's family recipe. 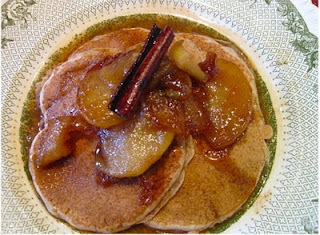 It calls for butter, apples, brown sugar, and cinnamon.